. . . Well . . . it’s exciting to us amateur astronomer types. 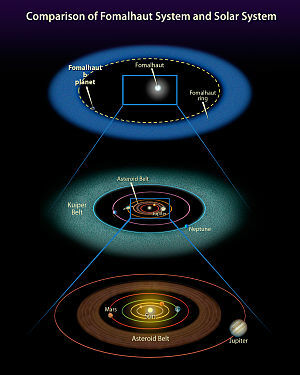 The latest news release from NASA and ESA reports that both Vega and Fomalhaut have satellite systems analogous to our own solar system, including planets, an asteroid belt, a Kuiper belt, and an Oort cloud. Both Vega and Fomalhaut are relatively close to us compared to most stars, and are easier to observe than stars that are much more distant, and much more difficult to for astronomers to investigate. This entry was posted in Astronomy and tagged Asteroid belt, ESA, European Space Agency, Fomalhaut, Kuiper belt, NASA, Solar System, Vega. Bookmark the permalink.